Focus is placed on learning to follow instruction in a warm, structured atmosphere. 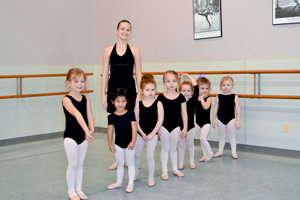 Basic ballet and tap skills are introduced and incorporated with fun songs and rhymes. Most importantly, students acquire a love for the art of dance from cheerful instructors. When students begin dance at an early age, they learn to be comfortable with their bodies, walking and moving with ease and confidence. Classes are offered mornings, afternoons and evenings.